Home / Personal Injury Interest Stories / How Will the Courts Deal with the Las Vegas Shooting? The Las Vegas Strip shooting, which took place on Sunday night, is now the deadliest shooting in American history, with 59 deaths and over 500 injuries. But what will the legal ramifications of this tragedy be? In recent years, almost every American tragedy has led to some form or other of civil action. The 9/11 attacks, the Oklahoma City bombing, and countless mass shootings from Columbine to Sandy Hook have resulted in civil lawsuits being filed by the victims and their families. One important thing to keep in mind: these lawsuits are not the same thing as criminal proceedings. In a criminal lawsuit, the perpetrator of a crime is brought to justice by the state, and sentenced to a punishment such as prison time. This is an important means of exacting justice, but it provides no direct benefit to the victims of the criminal. In a civil lawsuit, however, the survivors of a mass murder, along with the loved ones of the deceased victims, file a claim for monetary compensation for the losses they have suffered. They may file suit against any number of agencies, ranging from gun manufacturers who sold the perpetrator weapons, to premise owners who may have been negligent in protecting their premises. Not all lawsuits which occur in the wake of a tragedy succeed; the American personal injury system is nothing if not dispassionate, and even individuals who have suffered a horrific wrong are not allowed to proceed with their lawsuits if they do not have sufficient legal grounds. However, when those affected by a tragedy have a legitimate claim as acknowledged by law, they have every legal right to follow their lawsuit through to its conclusion. So the question is, will the Las Vegas shooting lead to one or more lawsuits? The answer is yes, it probably will. Who will the victims sue? Well, the first and most obvious defendant is the shooter, Stephen Paddock. Paddock is now dead, but he leaves behind a significant estate, which his victims could use to pay their damages. The problem with this is that Paddock was only one individual, and his attack has left hundreds dead or injured. Although there is not yet a full calculation of damages caused by the shooting, they will likely be astronomical. Even though Paddock was appears to have had millions of dollars to his name, his entire estate will barely even begin to cover the full amount of the damages that he caused to his victims. With Paddock’s estate exhausted, the victims who choose to sue for their injuries will likely turn to the next most obvious culprit: the Mandalay Bay Hotel, the location from which Paddock committed the shooting. Of course, the Mandalay Bay did not intend for the shooting to happen. However, an attorney could argue in court that they were negligent in their security practices, and that this negligence was what permitted the shooting to take place. Here’s what we know: Stephen Paddock had around two dozen guns in his hotel room at the time of the shooting, and he was in the room for several days before the shooting took place. Should the Mandalay Bay have recognized that one of their guests was bringing in a whole bunch of high-caliber weapons and apparently making extensive preparations for a massacre? Was it incumbent on them to notice what was going on and alert the authorities? An attorney for the victims will likely argue in court that the Mandalay Bay did indeed have such a responsibility. The hotel will undoubtedly have its own opinion on this claim, and fight back against the lawsuit. Who will win? At this point, it’s impossible to say. 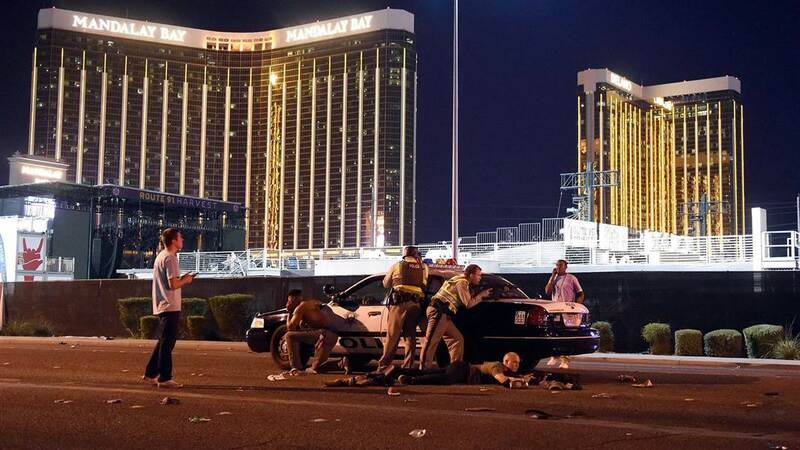 But the jury that hears a case involving victims of the Las Vegas shooting should be prepared for an emotionally fraught courtroom scene. If found responsible, the hotel may be on the hook for a huge sum of money sufficient to cover all of the various damages of the deceased and injured victims, perhaps ranging into the hundreds of millions, if not billions, of dollars. Victims of the shooting may also choose to sue the organizers of the Route 91 Harvest festival, the concert at which the shooting took place. If they choose this course of legal action, they will likely allege that the organizers set up fencing or other protective measures which made it more difficult for concert attendees to escape once the shooting began. This lawsuit, too, is far from an assured victory, and the concert organizers will no doubt fight back against any claims made against them. In sum, only time will tell what the legal outcome of the Las Vegas shooting will be. But if history has taught us anything, it is that this matter will likely have its day in court. In the meantime, we at Torklaw would like to express our deepest condolences to all of the families of the victims, and to wish all those injured a speedy recovery.